We were engaged to provide public relations services to promote Enlighten 2015, an event that invites visitors to experience Canberra’s cultural institutions in a new light. The primary aim of our services was to increase interstate and local attendance at Enlighten by promoting the event to target audiences through media and other PR activities. contentgroup developed a comprehensive public relations strategy, fine-tuned a broad and detailed distribution list, developed media materials and maintained regular contact with key media contacts in the lead up to and throughout the event. We applied an “always on” approach to our work. contentgroup collaborated with a range of stakeholders to design and run a creative media activation opportunities, including a pop-up preview of one of the most-anticipated installations on the Enlighten program. To ensure coverage with long-lead magazines, we distributed a diary date to 600 publications and developed a suite of tailored pitches to editors of a variety of publications. contentgroup also ran a number of promotional give-aways with local and regional media to help build the Enlighten brand, create event advocates and increase visitation. 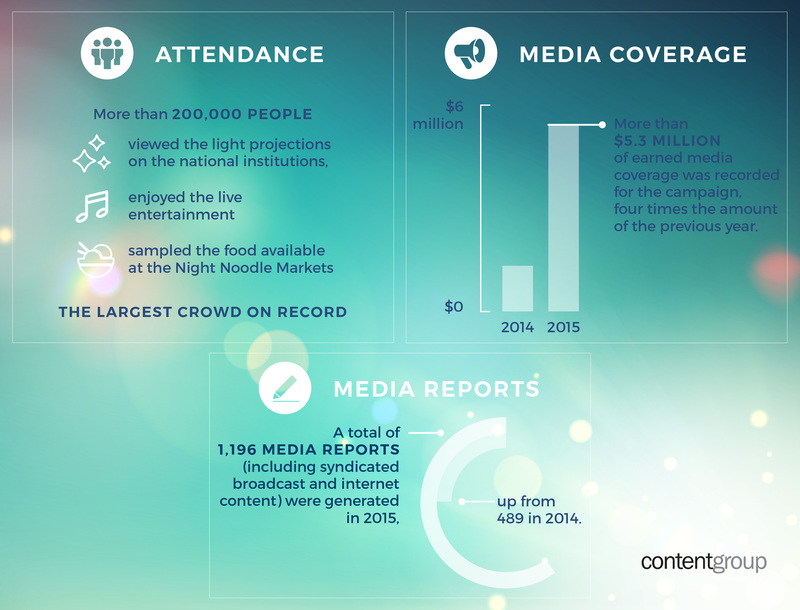 More than $5.3million of earned media coverage was recorded for the campaign, quadrupling the previous amount gained for Enlighten. A total of 1,196 media reports (including syndicated broadcast and internet content) were generated in 2015, up from 489 in 2014.